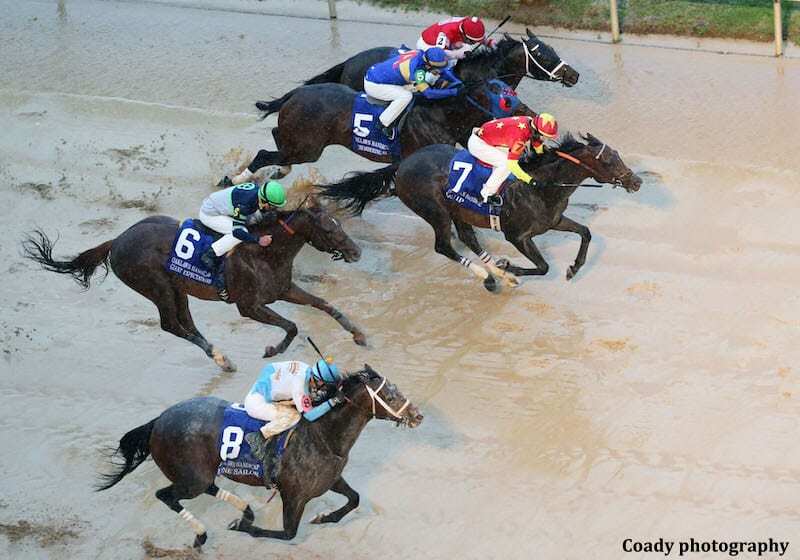 Quip, making just his second start since finishing far behind Justify in the 2018 Preakness, held off a fast-closing Lone Sailor to win Saturday's $750,000, Grade 2 Oaklawn Handicap by a neck. Pioneer Spirit finished another neck back in third, a neck in front of Remembering Rita, who was a neck in front of Giant Expectations in a five-horse blanket finish in the 1 1/8-mile race for older horses at the Hot Springs, Ark., track. They were followed by Rated R Superstar, 2-1 favorite Tenfold, Lookin At Lee and Chris and Dave in the field of nine. Owned by breeder WinStar Farm in partnership with China Horse Club and SF Racing and trained by Rodolphe Brisset, Quip was ridden to victory by Jose Ortiz. He covered 1 1/8 miles on a sealed sloppy racetrack in 1:50.21. Quip is a 4-year-old colt by WinStar's Distorted Humor out of Princess Ash, by Indian Charlie. He carried 116 pounds, one less than co-highweights Tenfold and Giant Expectations. Breaking well from the No. 7 post position, Quip raced off the rail while in fourth position early as Pioneer Spirit set the early fractions of : 23.65 and :47.96. Remembering Rita prompted the pacesetter and those two pulled away from the pack approaching the far turn, the opening six furlongs clocked in 1:11.99. That's when Ortiz put Quip into gear, and he was joined to his outside by Giant Expectations, who had been lurking just behind. Those four horses raced as a team to the furlong pole – Pioneer Spirit to the inside, Remembering Rita to his outside, and Quip and Giant Expectations to their outside – the mile in 1:37.46. In the final furlong, Lone Sailor, far back early, launched his bid but just fell short at the wire under Flavien Prat. “Quip was very game and never let them by him,” said Ortiz. The win for Quip was his fourth in eight career starts and the first since taking the G2 Tampa Bay Derby in March 2018. He then finished second behind Magnum Moon in the G1 Arkansas Derby before running poorly in the Preakness and getting the remainder of 2018 off. Quip came back to run third behind Prince Lucky and Copper Town Feb. 23 in the G3 Hal's Hope at Gulfstream Park. and trained at Payson Park in Florida leading up to the Oaklawn Handicap. This entry was posted in NL List, Racing and tagged china horse club, distorted humor, Horse Racing, lone sailor, Oaklawn Handicap, oaklawn park, quip, rodolphe brisset, sf racing, thoroughbred racing, winstar farm by Paulick Report Staff. Bookmark the permalink.